The latest Eye Critique deals with the hallucinatory title sequence to Gaspar Noé’s Enter the Void. Joel Karamath’s article in Eye 39, ‘Overtures and psychotic symphonies’, dealt with two classic examples of the genre: Saul Bass’s Vertigo opening and Maurice Binder’s iconic Bond titles. Above: Title sequence from Dr. No, 1962. Design: Maurice Binder. Music: John Barry and Monty Norman. Director: Terence Young. © United Artists Corporation. In Dr. No Maurice Binder sows the seeds for what was to become the classic Bond opening, from the white circle to the go-go dancers. The four sections of Binder’s opening are paralleled by four distinct soundtrack segments. In the first part, Binder’s dot logo is seen accompanied by high-pitched electronic test tones (which, like the dot, links Bond, the film and the onset of the computer age). A gun shot then ignites the dot-matrix spectacular, introducing the title of the film in the second segment, along with Monty Norman’s Bond theme. Stage three uses an exotic bongo rhythm for the dancing figures, which then develops into a calypso version of 'Three Blind Mice', a tentative first use of the Bond device of using a theme song linked to the story. Above: Title sequence from Vertigo, 1958. Design: Saul Bass. Music: Bernard Herrmann. Director: Alfred Hitchcock. © Universal Studios. 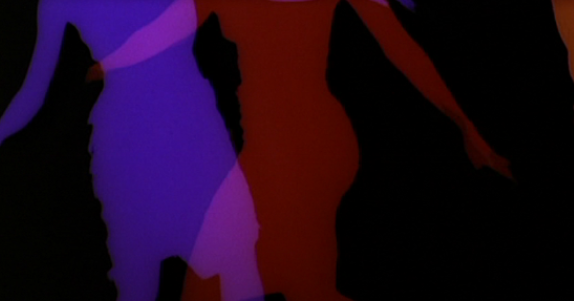 Bernard Herrmann scored the ‘Prologue’ music to Saul Bass’s visuals in Hitchcock’s Vertigo, constructing an uncannily evocative piece that far outweighs the sum of its parts. Appropriately enough for a film about image and identity, the title appears over a full frame of the leading lady’s eye. As we are drawn into the centre of her iris a small, vortex begins to spiral and grow until it engulfs the whole screen. This spiralling icon, coupled with the repeating melody, provides a theme that runs throughout the movie, representing Scottie’s vertigo, the coil of hair on a woman’s head in an oil portrait, a bouquet of flowers and the winding wooden staircase of the bell tower from which Madeleine falls to her death. This is an extract from ‘Overtures and psychotic symphonies’ in Eye 39. 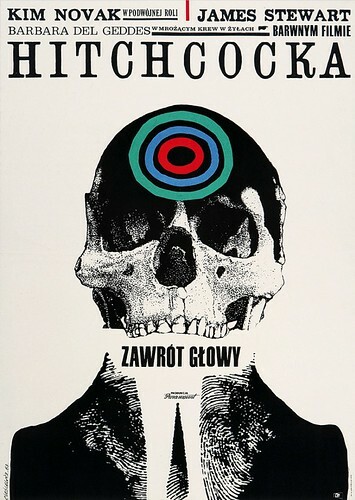 Below: Roman Cieślewicz’s 1963 poster for Hitchcock’s Vertigo. See Margo Rouard-Snowman’s ‘Reputations’ interview with Cieślewicz in Eye 9.